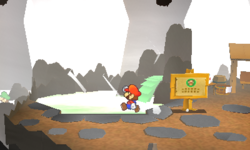 Rugged Road is the penultimate level of World 5 in Paper Mario: Sticker Star. It is a lava-covered area with many lava flows and meteors. It also has a hidden hot spring. The level starts out in a mountainous area. Passage through the area is blocked by lava geysers. Placing The Refrigerator or any other cold based Thing Sticker on the volcano via Paperize will cause the entire area to freeze, allowing for passage over the now frozen lava geysers. Hidden in the small, frozen pool is a chamber with the Turkey. The next area is a large lava pool guarded by Fire Piranhas. Rocky platforms must be jumped over quickly to avoid being scorched by the lava. After the lava flow, there is a small hole in the wall that can be peeled off via Paperize. After passing through the lava flows, there is an area with two gigantic boulders stacked onto each other. Dropping down from the main path will reveal a boulder that can also be peeled off and replaced by the Mountain Hole scrap. The Mountain Boulder scrap can be placed where the hole once was to allow access to a high platform with a few stickers and the Car Sponge. The hole can then be passed through to get down to the lower boulder. Hammering the crack in the lower boulder will cause the upper boulder to topple over, creating a bridge on the upper path that leads to a Heart Block and Save Block. The area leads to another area with raining meteors that come straight at Mario. Baiting the meteors to crash into a certain hole will reveal access to the secret hot springs, where a sticker, Luigi, and the Cracked Boulder scrap can be found. Passing the second lava flow by carefully hopping on the floating rocks will take Mario to the next big boulder stack. Taking the lower path will allow Mario to get to the lower boulder, but this time, there is no crack. Instead, there is nothingness. The Cracked Boulder scrap can be placed here and hammered to drop down the upper boulder right on top of the Comet Piece, smashing it. The boulder can then be peeled off, flipped over, and re-positioned to reveal the Comet Piece. The Secret Door is located on the right side of the big lava pool. It can be accessed after freezing the area. It contains the Basin. This page was last edited on April 18, 2019, at 09:23.